Qualified from University of Turku, Finland in 1998 and has been practicing dentistry since that date. Firstly in Finland, then Devon before joining HDS in 2001. Dedicated to providing high quality care in a comfortable and relaxed atmosphere. 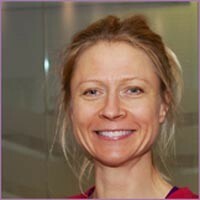 Special interests in restorative dentistry and is currently working towards a postgraduate diploma (part time). I regularly attend courses both in the UK and abroad and have completed a year long course in Advanced Aesthetic Dentistry. My leisure time involves traveling to different countries and I always enjoy comparing my travel notes with my patients. I always receive an excellent service when I contact/visit HDS. All of the staff are polite and friendly. Carita and Helen offer a superior service and although you may have to wait in the waiting room for longer than you want, you know that the service they offer to everyone, is well worth the wait. Can't fault them ! Thank you ! Dr Carita Wegner is extremely professional and explains everything to you. She is thorough and I am very happy with the service she provides. Overall this Dentist and Dental Surgery are fantastic and I would recommend. Most people dislike a visit to the dentist but I'm not one of them ! Carita, Helen and the ladies at the reception give a first rate service. Always happy and delivering an excellent, professional service. I cannot praise them enough ! Thank you ! Carita is a wonderful dentist and really takes the time to explain everything. I am lucky enough to not often need treatment, bur when I have, Carita is truly an amazing dentist, I will never go anywhere else. All the staff are very kind and professional. I have three children. One has a brace and the other two have had problems with their milk teeth not coming out which has necessitated extractions. The treatment of all three children has been superlative. All the staff have been kind and considerate as well as professional and knowledgable. Even after all the treatment, I still have three children who don't mind coming to the dentist. This is due entirely to the amazing service which is offered by everyone at this practice.